The Sa'hak-ren are a two-armed and four-legged race, with three long fingers on each hand and three toes on each leg. Their four legs all join to the same set of hip joints. The Sa'hak-ren developed the technology for spaceflight around 90,000 BE. About 49,000 B.E. 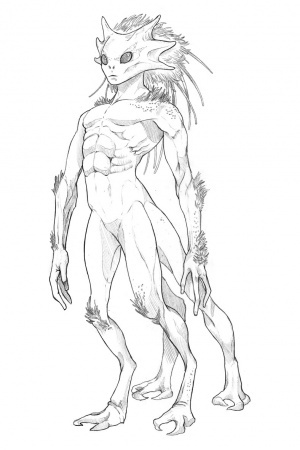 they first encountered the Cleax and discovered their unique biology, spurring the development of the Sa'hak-ren's expertise around biotechnology. About 1400 B.E. they began to experiment on the Bushraki, using Cleax genetics. In 479 B.E. they destroyed a budding Nath-el Empire. In 418 B.E. they used the Bushraki to subdue the Xariel and turn them into a client race, but by 366 B.E. the Bushraki had become so uncontrollable that the Sa'hak-ren abandoned them to their own devices. Sometime prior to 210 A.E., they agreed to ally with the Ishvana, whom they initially had great respect for, believing it to be the most impressive biologically-originated consciousness in existence, and participated in the Second War of the Ishvana. After the Bushraki revolt against the Ishvana, partly because of its alliance with the Sa'hak-ren (whom they hate with a passion for the way the Sa'hak-ren ruined their race), the Sa'hak-ren were ordered by the Ishvana to devastate Dikamazi, the Bushraki homeworld, which they happily did. The Sa'hak-ren are a race whose territory overlaps part of Starmourn, and occupies an unknown amount of space beyond it. They are a race that refuse to ever subordinate themselves to machine-based decision-making, due to a singularity event they experienced in the distant past in which Artificial Intelligence-controlled machines nearly wiped them out. Now, they will use only biological intelligence to control machines. As a result, their starships are controlled by living brains, and a lot of their terrestrial weaponry consists of creatures augmented with technology. Though they are experts at biotechnology and cybernetics, they don't take existing creatures and augment them, and they never augment themselves. Instead, they prefer to genetically engineer creatures who will accept advanced implants from birth/hatching. There's nobody better at combining biology and technology than the Sa'hak-ren. This page was last modified on 7 August 2017, at 22:47.